The FM 222 provided the big breakthrough for vinyl reproduction that hundredthousands of collectors and aficionados had been waiting for. With the singular features and circuits of the FM 222 it was for the first time possible to realize what wealth of detail and information lay buried in record grooves. It truly is phenomenal what realism and incredible music reproduction can be extracted from decent vinyl. A total re-vitalization of record reproduction was finally possible. A short demonstration convinced even the most sceptical engineers and listeners. The rest is history: the FM 222 - manufactured continuously since 1992 - has become a tremendous success. More orders than ever poured in when the "MKII" version was introduced 7 years ago. Carefully perfected, it provides a performance so far ahead that no one else even tried to challenge it. Never has there been anything comparable. Recently, new parts have become available that - together with advanced insights due to continuous research - allow further ameliorations. The refinements manifest themselves in some smaller modifications but also some more substantial improvements. It is a pleasure indeed to announce the "MK-III" version of the FM 222. Of course, all the original features have been kept and some new ones added. Everything has been carefully optimized. 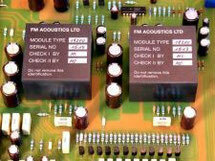 For the true balanced outputs FM ACOUSTICS new proprietary "HR" type 19200 modules are employed. These new HR modules are the result of a research-intensive multi-year development. They achieve a superb level of reproduction and reliability. Never before has such a level of accuracy been achieved. To avoid negative influence from spurious resonance and guarantee positive stability, the FM 222-MKIII employs FM ACOUSTICS new resonance-eliminator supports. These isolate the electronics from potential resonances and vibrations. Selection combined with most dedicated hand-craftsmanship contributes to breathtaking vinyl reproduction. New HR modules are also used elsewhere. The input circuit now provides an astounding 100dB(!) of rejection of Common Mode signals (signals such as interference, hum, noise etc.) making the FM 222-MKIII immune to interference. This rejection is achieved not with cheap op amps but with fine-tuned discrete Class A circuits guaranteeing ultimate resolution in the unique FM ACOUSTICS way. an even lower interchannel crosstalk (more than 40dB better than the best cartridge/tonearm combinations). For unusual cartridges, different gain settings can be programmed internally. a multitude of layout refinements that achieve some slight and some more noticeable improvements. an absolutely unmatched CMRR on input (100dB!) guarantee rejection of hum, noise, RF and interference. The result: unmatched "true" balancing with perfect signal symmetry. Immense improvement of LP and Shellac reproduction. Record collections gain a new life. The absolutely ultimate in phono linearization and preamplification. The world's only true balanced symmetrical phono preamplifier. Unique variable "non-RIAA" de-emphasis allows linearization of any recording ever made. Continuously variable controls allow precise restitution of any pre-emphasis curve ever used. For the first time records can be reproduced exactly as they were cut. Ultra-high accuracy RIAA record compensation circuitry. The only preamplifier providing truly accurate reproduction of vinyl LP's, EP's and Shellac records. Cartridge loading allows optimization of any MC or MM cartridge. Outputs optimally interface to true balanced, pseudo-balanced or unbalanced loads. They automatically adjust connection for optimal performance. Zero overall feedback or feedforward. Uncover rare vinyl treasures with the FM 222 MK-III's linearization controls. Entire unit uses discrete circuitry. Special dynamic curve-tracer analysed semiconductors. 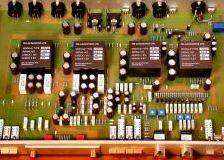 Proprietary enhanced Class A circuitry: no signal degrading IC’s, transformers, hybrid circuits, tubes or op-amps. 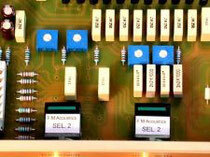 Hand-selected, high precision, matched components of DIN, IEC & MIL standard guarantee accuracy and long-term stability. Performance without equal as the technology, the circuitry and the manufacturing methods are proprietary to FM ACOUSTICS. The ultimate for restoration work, mastering studios, libraries, precise monitoring and for demanding record collectors. With the FM 222 MK-III's variable RIAA de-emphasis it is now possible to accurately play back important earlier LP’s and 78’s. With accurate equalization and true balanced Class A amplification stages an absolutely astounding amount of information can be extracted from these record grooves. It is amazing how much of the sound made it on record but discs of this area can lack a bit in transparency. With the continuously variable de-emphasis of the FM 222 MK-III - no switches used! - it is now possible to compensate for such effects by fine tuning the de-emphasis/RIAA curve. By varying the "10 kHz ATTN." control on the front panel the attenuation can be reduced to less (or increased to more) than the standard 13.75 dB of the RIAA curve. This feature will revive some records that previously sounded dull and lifeless, providing a wonderful musical experience. While some of the older LP's have high surface noise, by far not all of them do. Some of them are recorded superbly, some include stellar performances. There are many treasures to be uncovered.